A play of geography, geometry and light, Crescent House is a singular, undulating sculpture that weaves through lush, coastal gardens to reveal enchanting views across Sydney Harbour to distant Middle Head. Designed and built for a young family, the home takes full advantage of its northerly aspect, panoramic vistas and direct access to the Harbour foreshore. "The brief was to create a future-ready home that captured various opportunities to entertain, relax and rest amongst gardens and Harbour views," says architect Matthew Woodward. Once entered, the house is experienced as a sequence of volumes through mass, concrete and whiteness. Playful plasticity of form provides thoughtful connections across the various spaces and landscapes areas. The overall design aesthetic is minimalist, characterised by the use of monochromatic materials incorporating fragments of greenery, brass and reddish tones. This palette encourages continuity with the colours of the external garden, blurring the delineation between inside and out. The materials were also chosen to withstand the elements and age gracefully in their setting. In this context, concrete was the perfect choice - balancing the structural challenges, durability requirements and sensorial aspirations of the clients. 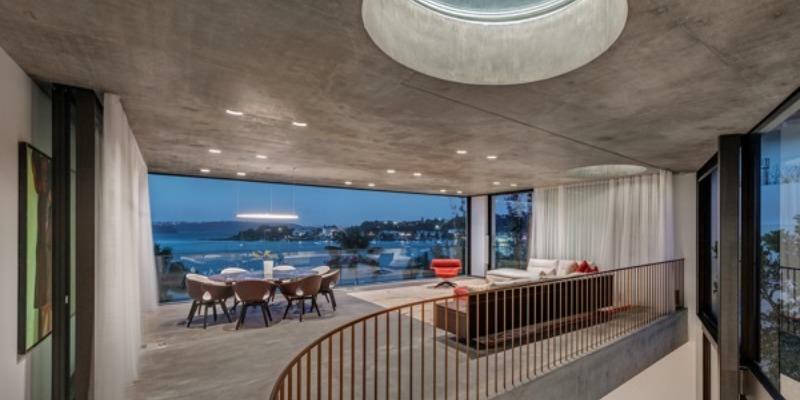 "They (the clients) wanted to express and honour off-form concrete as a true reflection of the building process, relaying a story of the construction process throughout the home," Woodward says. The site is a relatively tight lot, narrow and long in proportion, constrained by neighbours either side and the Harbour foreshore at the rear. Primary access for construction was via the narrow street frontage at the highest point of the site. The geological morphology consisted of Sydney Harbour sandstone, which provided opportunity for stable bearing for the house's foundations directly onto bed rock. Concrete was poured for the floor and roof structures, with a mixture of core-filled concrete block walls and concrete blade columns. For the most part, the formwork in the soffits was expressed and joint lines considered to align with various building components. Burnished concrete topping slabs with expressed stainless-steel strip joints were poured to contain in-floor hydronic heating and to achieve a controlled floor finish. Stairs were a mixture of poured monolithic concrete treads for internal and formed on-site pre-cast planks for the side access stair, allowing natural ventilation to flow through to service corridors. Complex geometry and radial forms were constructed using a mixture of standard formwork, integrated with profile polystyrene mouldings supplied by Ezytube. Woodward says craftmanship was critical at the connection between form mouldings and plywood formwork to ensure tightness of joints for a seamless off-form appearance. The process of deconstructing the overall geometry into segment of parts allowed uniform complex volumes to be constructed. Passive solar heating and cooling is a feature of the design through thoughtful site-responsive planning, considered location of openings, external shading devices and thermal mass.